Office workers spend a substantial portion of their lifetime in the indoor environment of office buildings which influences their wellness and productivity. Building owners manage the associated risks through regular appraisal of indoor conditions and mechanical plant. And all stakeholders benefit from the transparent information that building ratings provide to the market. At QED Environmental Services we work with building owners, managers and tenants to ensure compliance and performance of indoor workplace environments, particularly multi-tenant office towers. We are the only NATA accredited company in Australia for Indoor Air Quality Inspections and NABERS Indoor Environment Base Building ratings and undertake most of our work in Premium, A-grade and B-grade office buildings all over Australia. The importance of healthy indoor air has also been accepted within Building Rating Tools (NABERS IE, Green Star and WELL Building Standard), where performance in good indoor air quality receives significant recognition. 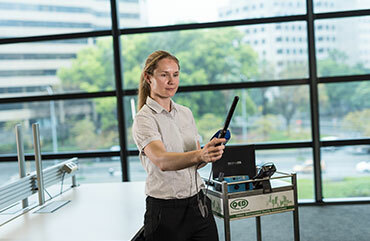 QED Environmental Services is one of Australia’s leading Indoor Air Quality consultancies, managing air quality in over 400 office buildings nationally, with over 1,000,000m2 audited each year. The scope of our compliance programmes in office buildings usually includes potable water testing because the plumbing systems in many buildings incorporate holding tanks or similar features which present a risk to be managed. To ensure the safety of occupants and contractors, regulations oblige all office buildings to maintain current registers of stored chemicals and hazardous materials in their structure. QED schedules regular audit inspections and because we specialise in office building compliance programmes, clients benefit from our tailored online service to keep their registers up to date. For 25 years QED has worked in office buildings across all the major cities of Australia, assisting institutional owners such as Brookfield, Charter Hall and Dexus as well as the major managing agencies including JLL, Colliers, Knight Frank, CBRE and Savills. For independent expert advice our opinion is often sought by tenant organisations or by architects or engineers.